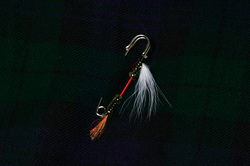 The Kilt Pins featured here are designed using actual Fly-Fishing Fly "recipes." 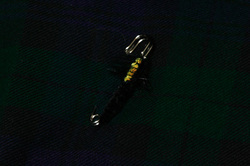 They have been augmented as necessary to fit on a 3" Kilt Pin. In Royal Coachman-The Lore and Legend of Fly-Fishing, Paul Schullery said of the Royal Coachman, "No fly better represents this freewheeling era [late 19th century] in fly tying than the Royal Coachman, which among the general public may be the world's best-known fly. Its name has the right combination of romance and class to appeal even to people who don't fish, and the fly has such a commanding appearance that few fly fishermen can resist having some permutation of the pattern in their fly boxes, even if they never use it. Most of them don't know it, but the Royal Coachman is the first great American fly pattern..."
Bring that same romance and class to your kilt now. Early summer in Montana means one thing for Fly-Fishermen - Stoneflies. Stoneflies are the largest aquatic bug found in the entire world, and are found in all corners of the world (except for Antarctica). Looking like a microscopic monster, this nymph's large, muscular legs allow the nymph to live in the fast flowing waters of rocky rivers across the world. Sir Horace Winstrople is said to have designed the Hairy Mary, and in some ways tis true he was responsible. Ya see, Sir Horace liked to use more than his fishing rod when on holidays. But alas one particular autum he got carried away with himself, twas too much drink that caused his dicretion with the tinker girl , young Mary O'Brien with the flaming brown hair. Come the following March Sir Horace was back for a few springers, and poor Mary was heavy with child. Flanagan the Ghillie in his own discreet way mentioned it in passing to Sir Horace that "isnt a shame about poor Mary, and no money to raise a child", but his lordship wasn't biting. Flangagan , not easily deterred came up with a scheme. He arranged that Sir Horaces favorite pools be netted early every morning and all the pools for 2 miles below to be netted likewise. After a few days his lordship got very frustrated - not a fish to be seen. Flanagan told him that he had a new fly that he guaranteed would catch him a fish within three days - but the fly had a secret ingredient, and Sir Horace would have to agree to the asking price if the fly proved its worth. Sir Horace agreed, the netting ceased immediately . On the second day the new Fly accounted for 4 of the finest spring salmon , the smallest being 14lb. Now Sir Horace , says Flanagan there's the small matter of the new Fly. Off course says sir Horace taking a guinea from his wallet . No says Flanagan, 500 Guineas is the price, and its cheap at that. 500 GUINEAS, bellowed Sir Horace - for a blooody fly, have you gone mad Flanagan. Ah but Sir Horace, thats no ordinary fly, thats a Hairy Mary - and tis said that neither man or fish is safe from her charms - twould be wise for all concerned sir if you paid the asking price. And so was born the Hairy Mary - fished by few but there's one in everyone's fly box. 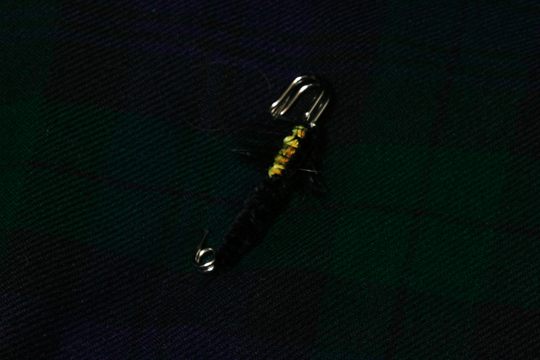 It won't cost you 500 Guineas to put this on your kilt.